“Wild Life” – A man’s fatal fall from a hotel balcony launches the CSIs into an investigation to determine if his death was suicide or the result of foul play, on CSI: CRIME SCENE INVESTIGATION, Thursday, Nov. 18 (9:00-10:00 PM, ET/PT) on the CBS Television Network. Okay. What does this mean? Well … I’m not sure. It means I have to watch every episode, for sure, but it doesn’t really tell us anything we didn’t know, which is ‘she’s a member of the main cast.’ Billing and listing negotiations confuse everyone, so one possible option is that CBS has screwed up all their press releases up till now. Or they’re messing it up now. Can’t say for sure. At this point, I’m cautiously optimistic, though. I think that her contract have changes days before the premiere, and she probably was a main cast member since episode 1, but CBS Press didn’t know her changes in the contract. This is my point of view ;). Unlikely that CBS press didn’t ‘know’. In fact, near impossible. It’s possible they messed up, but they did have to know (it’s their job to know, and I mean that literally). It’s also very unlikely they screwed up for 8 episodes and THEN got it right. Plausible deniability, that what they could claim. If negotiation are going well but at the last moment it fell apart; then they could say we were in the dark. 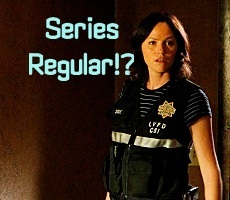 But after House of Hoarder and Bump and Grind I’ve come to the conclusion that TPTB at CSI are grooming Jorja to move into the female lead. I seem to remember that someone from CSI/CBS said that Mis Fox would be credited with the main cast for the shows she was in. Or was that you Ipstenu? We don’t know — but I would think it indicates something changed in her contract. (Like she decided to be in more episodes in exchange for higher billing and likely more moolah…) At least out here in realityville, that would be the logical reason. Not saying that Hollywood works the same, though! So glad she’s going to be in more episodes! She has been doing a great job. Do you think it goes back to ratings? Jorja’s episodes have had more viewers than others–I think House of Hoarders had the most viewers so far this season, except for the first one. Whatever the reason–I’m happy she’s bad, even if she is on every other episode. Now if we can learn where her hubby is! That’s a theory I’d be willing to bet on. Mind you, it all comes down to if Jorja wants to re-commit to CBS. Without knowing how she feels about it (and it’s very possible she likes this part-time gig), it’s hard to guess what anyone’s reasoning is.